I have to admit that like most people im a sucker for a good gadget and here are 3 pretty cool travel gadgets that might just flick your switch. This slick pack of solar power is a very neat take anywhere power station. It clips apart easily, you just affix the two solar panel wings to the main unit and it'll soak up the sun turning it into stored power for when you next need it. 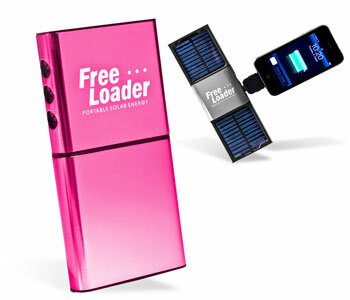 Once charged, the Freeloaders' internal battery can power an iPod for 18hours, a mobile phone for 44 hours, PSP for 2.5 hours a PDA for 22 hours and much, much more! The central unit can also be charged up from your PC by USB cable if the sun's looking a little on the shy side. It comes in either silver or a rather fetching steely pink with a whole clutch of adaptors for all your gizmos. 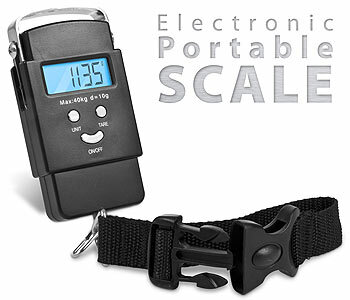 With a set of lightweight Digital Luggage Scale you can weigh all of your cases to make sure they don't exceed the maximum baggage allowance - and they're small and light enough to pop in your handbag. Jetting off around the world on less than the price of an airport sandwich is all well and good, but one pair of sandals too many can have you cursing the god of luggage while airport officials bite a hefty chunk out of your holiday pocket money by way of an extortionate excess baggage charge - and that's just on the flight out. If, like lots of inebriated tourists tend to do, you find yourself inexplicably drawn to that wicker donkey you spied in Alicante (it's going to look just fabulous next to the chaise lounge, isn't it?) you could find that your cerveza-fuelled impulse buy becomes even costlier when you check in for the flight home. 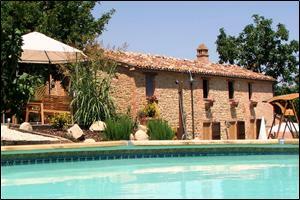 Perfect for the jet setter who doesn't want to skydive into the red. Holidays are a time to relax, so the last thing you need when you get home is a huge phone bill. Overseas call charges can cost you a fortune but help is at hand to help you keep your costs down. 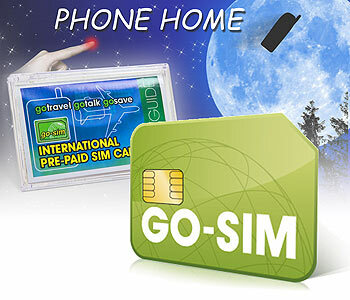 With GO-SIM it won't cost you the earth to keep in touch, even when you're on the other side of the globe. In fact you can save up to 85% on calls from 175 countries around the world. Or to put it another way, you can chat for up to six times longer than you would with a standard network provider. As the world's leading supplier of global SIM cards, there are a number of other exciting benefits too. For example, in over 75 countries your incoming calls are FREE. So depending on where you are, you won't have to pay a penny if someone contacts you. You won't get charged for any texts you receive either. Add to that the fact that your GO-SIM card and any credit on it never expires - unlike similar services - and you've got incredible savings for life. GO-SIM really is the perfect travelling companion. You can top up online, anytime, and we'll even give you ?5 or ?20 free airtime to get you off to a flying start. So no matter how far you travel, make sure you pack a GO-SIM card.